Well that was easy, right? Of course it wasn’t. This is the New Orleans Saints, after all. The Black and Gold are guaranteed to give you your entertainment dollar and put a few gray hairs on your head in the process. Sunday’s 31-26 Wild Card victory over the Carolina Panthers would be no different but as Gertrude Stein once said, “A win is a win is a win.” OK, Gertrude Stein didn’t actually say that but it was the city and team’s mantra after posting their first playoff victory since the 2013-14 season and eighth straight victory at the Mercedes-Benz Superdome. It was a day to remember that featured Drew Brees doing Drew Brees things of old and Cam Newton playing his best game of the year and almost completing an improbable comeback. Yet, with all of the buzz and stars running wild throughout the Superdome it came down to the guys who are often an afterthought until it is all on the line — the field goal kickers. It’s funny to look back and only then realize that you were watching one of the biggest plays of the game without even knowing it. Which is exactly what was happening when Carolina’s Graham Gano lined up for an easy 25-yard field goal that he pushed to the right of the goal post for only his second missed field goal of the year. At the time, everyone was happy just because the Panthers blew an opportunity to score first but this miss would loom large in the last seconds of the game. Before the exciting conclusion, however, was another silent yet major play in the game as the two teams’ defenses hunkered down in the third quarter and kept each other out of the end zone. 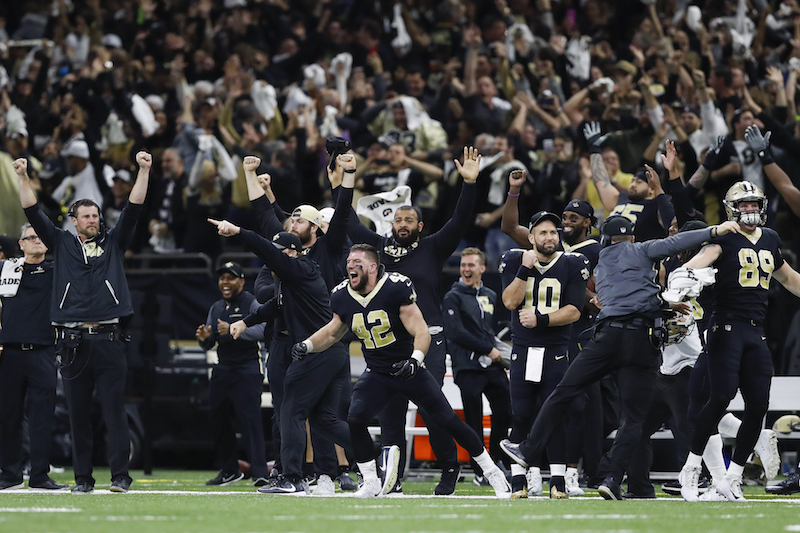 It was at the six minute mark, and after an intentional grounding call, that Wil Lutz sent a moon shot through the uprights, connecting on a 57-yard field goal, that put the Saints up 24-12. And again, everyone was happy but wouldn’t realize the importance of these two kicks until the Panthers drove the ball down the field with less than a minute left. As it played out, the Panthers had to get a touchdown to win the game but if either of these two kicks had turned out differently, the Panthers would have been looking at an easy chip shot to break Who Dat Nation’s heart. It was a game that won’t soon be forgotten and a wild playoff victory for the Saints. A few years back a new addition to the venerable halls of “coach speak” debuted. It was the now tired “next man up” quote. Its meaning is that when one guy goes down with an injury his backup needs to come in and perform at a high level. Which is all well and good but what happens when you run out of men? Sunday’s victory was like many others this year. A big win for the team with some sobering news that one of their key contributors is done for the year. This week’s unlucky player was Andrus Peat, a player who has had plenty of ups and downs in his young career but has performed well this season and is a crucial loss. Peat now joins Zach Strief as the second starting offensive lineman to have his season cut short. Those two are joined by starting tight end Coby Fleener whose loss doesn’t feel that bad following a win in which Josh Hill caught three balls for 49 yards and a touchdown. On the other side of the ball it’s an absolute murderer’s row of injuries. The Saints are now without the services of starters Nick Fairley and Alex Okafor on the defensive line. The linebacking corps is missing A.J. Klein, Alex Anzalone, Nathan Stupar and Hau’oli Kikaha. The defensive backs join this dead man’s party with Kenny Vaccaro and Delvin Breaux watching from the sidelines as well. Read through that list again. That’s a ton of talent to have walking your sidelines and not out on the field. Every single player in this list is a starter or significant contributor. And now the Saints travel to Minnesota (13-3) to take on a nasty Vikings club on their home turf. Next man up? Indeed. The Vikings are led by Coach Mike Zimmer, a coach who builds teams around defense. Zimmer has built top 10 defenses in Dallas and Cincinnati as defensive coordinator. Now, in his first head coaching gig, Zimmer has done the same in Minnesota with a defense that ranks numero uno in points allowed per game, yards allowed per game and third down defense. The Saints ranks 10th, 17th and 27th in those categories respectively. This is going to be a grind it out affair. Brees isn’t going to be able to sit back and pick apart the defense this week. The club is going to have to be effective with the run to get this victory in Minnesota, which is concerning following a week where the Saints rushing attack only managed 45 yards on 19 carries. On the other side of the ball, the Saints will face a not-too-exciting but efficient Vikings offense. Case Keenum, seemingly coming out of nowhere and in for an injured Sam Bradford, is having his greatest season ever and has kept Teddy Bridgewater on the bench. The Vikings, after losing their starting running back Dalvin Cook, now feature Latavious Murray and Jerick McKinnon. These backs don’t have the boffo stats like Alvin Kamara and Mark Ingram but are a big part of the recipe for the Vikings 13-win season. The Vikings are just a scary team. The Saints and Vikings will kickoff their divisional playoff game on Jan. 14 at 3:40 p.m. Who Dat. As the city is gripped in playoff fever, just a quick note about the University of New Orleans Privateers basketball team. After taking some early non-conference lumps against bigger opponents the Privateers are into Southland Conference play and back to their winning ways, posting their fourth straight victory to remain undefeated in the conference. The Privateers have beaten teams below them in the pre-season rankings but also own a 72-62 victory over Lamar University. The Cardinals were picked to finish second in the Southland. The Privateers go on the road to take on Stephen F. Austin on Jan. 10 at 7 p.m.